You look at the cover art, check out the band name, read the album title, and get the peculiar feeling of something being a tad askew. But the seemingly strange contrast between the understood style of Italy's FLESHGOD APOCALYPSE and the album cover and title logically connect after one reads the lyrics and/or concept synopsis. It just so happens that the "tad askew" part applies to the music as well, in the case of the "Mafia" EP in the most laudatory sense, as the follow-up to last year's debut "Oracles" — itself a winning technically-oriented death metal album with a symphonic twist — outdoes its predecessor in terms of creativity and at least equals it from the standpoint of DM heaviness. It is a virtual guarantee that "wow" will not only be among the first words out of your mouth during the opening moments of "Thru Our Scars", but will be uttered with increased frequency all the way to the end. "Mafia" is just that kind of album. It is extremely rare that an EP released subsequent to a full-length album — and a debut at that — is such a significant step forward in a band's musical progression. Though unquestionably "Oracles" is a product of the highest quality, the incorporation of symphonic pieces amidst the storm trooping became fairly predictable after a certain point. That is not the case with "Mafia" where a smartly chosen array of eclectic and classy elements does more than offer contrast; it is part and parcel to the success of the song. Such is the case with the violin playing of guest Maria Letizia Massetti and clean vocal parts of bassist Paolo Rossi on "Thru our Scars", which fit shockingly well amidst an otherwise merciless DM onslaught that rivals, even exceeds, that of acts like BEHEMOTH. But it doesn't stop there. The seven-minute "Abyssal" includes infamous Sicilian mobster Totò "The Beast" Riina's vociferous speech about the mafia's de facto usurpation of State control, as taken from the "Il Capo dei Capi" miniseries (spoken in Italian and translated via the lyrics into English) and serving as a sort of thematic encapsulation in keeping with the group's description of the album concept (as follows). "The album focuses on the connection between racketeering and illness. It's like a hidden sickness that consumes us from deep within and that can't be erased unless you decide to wake up and face it. "Mafia is like an octopus whose tentacles grab everyone's free will…". And there you have the connection between cover art and album title. Moving on, "Conspiracy of Silence" pummels as relentlessly as it stuns with the seamless inclusion of melodic leads and another round of singing that is well suited to the arrangement, while the cover of AT THE GATES' "Blinded by Fear" comes off as though it was always intended to be a part of "Mafia". Even stranger for its effectiveness in completing the circle is the closing title track; a three-minute piano piece from guest player Francesco Ferrini that forebodes with flair, not unlike a dramatically suspenseful score from the silent film era. Hearing is believing. You too will be impressed with just how richly textured a merciless death metal assault like "Mafia" can be. But it's "only" an EP, right? 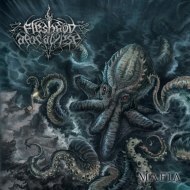 If "Mafia" is any indication of the direction FLESHGOD APOCALYPSE is headed, then start bracing yourselves now for the sophomore full-length. Watch out!